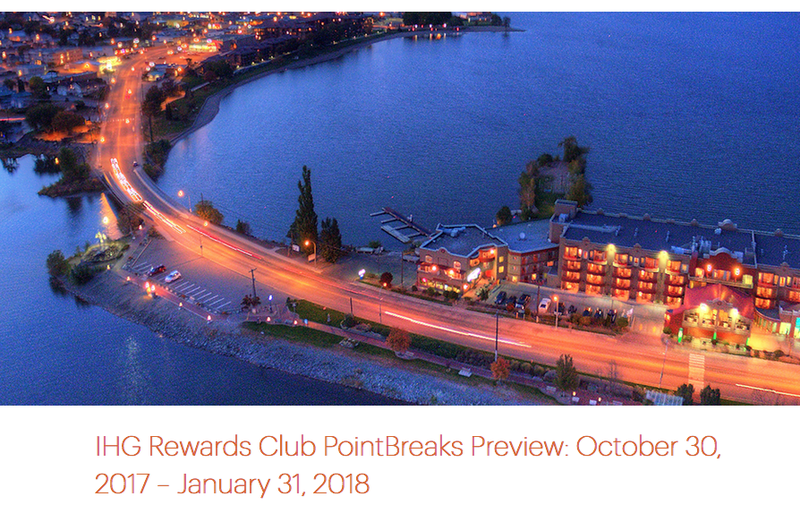 As we mentioned earlier today, IHG would give us a preview of the full list of hotels that you will be able to book on Monday for only 5,000 points per night in the latest PointBreaks. They are out now and this time we have an even 100 hotels available with 5 of them in Canada. Remember when Monday roles around the PointBreaks rules are that a member can only book up to 2 reward reservations per hotel participating in the individual offer (ie 2 at PointBreaks hotels and 2 at Last Minute Reward Night hotels). My tip to get around this if you need more than two reservations is to book 2 reservations with one IHG Rewards Club account and then have your spouse or partner book 2 more etc. Of course this is dependent on both accounts having enough points to redeem for these awards (See below for the buy points offer as an easy way into this). Also be sure to book these ASAP as soon as the list comes out as once the allotted nights are booked at certain locations those hotels will fall off the list. If you don't have enough points, even 0, you can buy points right now with a 100% bonus if you buy 5,000 or more points which works out to 0.5 cents per points. That means you can get each of the PointBreaks hotels for only ~C$32 per night if you buy points for the stay. You can buy points with the bonus here until November 3, 2017. You'll want to buy right away so the points are in your account by mid Morning Monday when these go live. Here is the full list of hotels that will be bookable on Monday.